We’ve recently been to the velodrome in Büttgen again to conduct another aero project with our colleagues of STAPS. 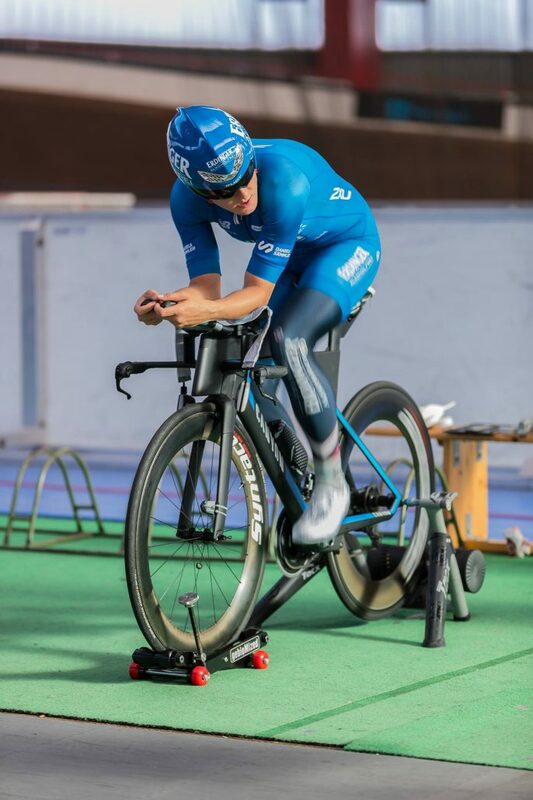 The fast legs that were to be tested and optimized belonged in this case to pro triathlete Daniela Sämmler who made the whole test very pleasant due to her extremely friendly manners. Her coach Utz Brenner was involved in the test protocol, too, just like Stefan Keul, bike expert of Daniela’s bike sponsor Canyon. At the beginning, Daniela’s very own athletics are being checked. 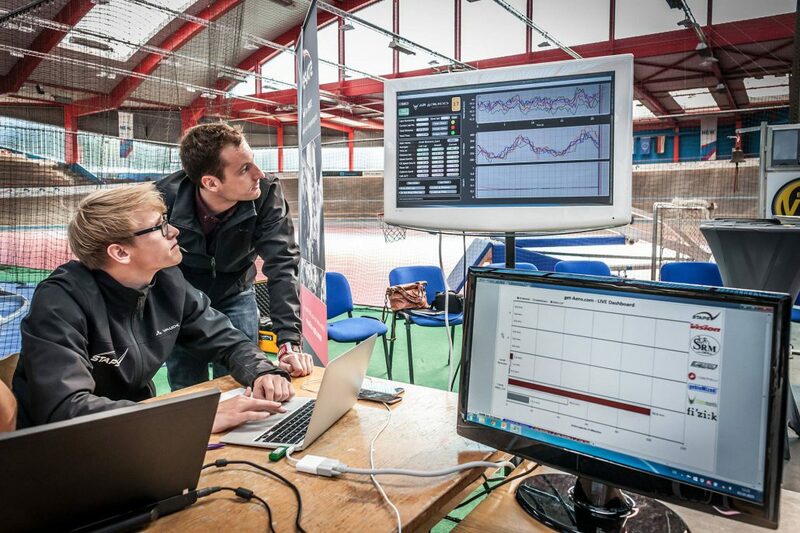 In various tests we are looking for small weaknesses with regard to mobility, flexibility and stability. 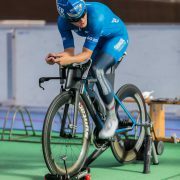 The focus is above all on the optimization potential for the aerodynamic bike position, run- and swim-specific causes are being considered as well, however (e.g. in case one-sided breathing during the swim leads to asymmetries in the back- and shoulder area). Daniela only shows minor weaknesses (e.g. strengthening of Gluteus medius) that can from now on be considered in her regular athletics training. 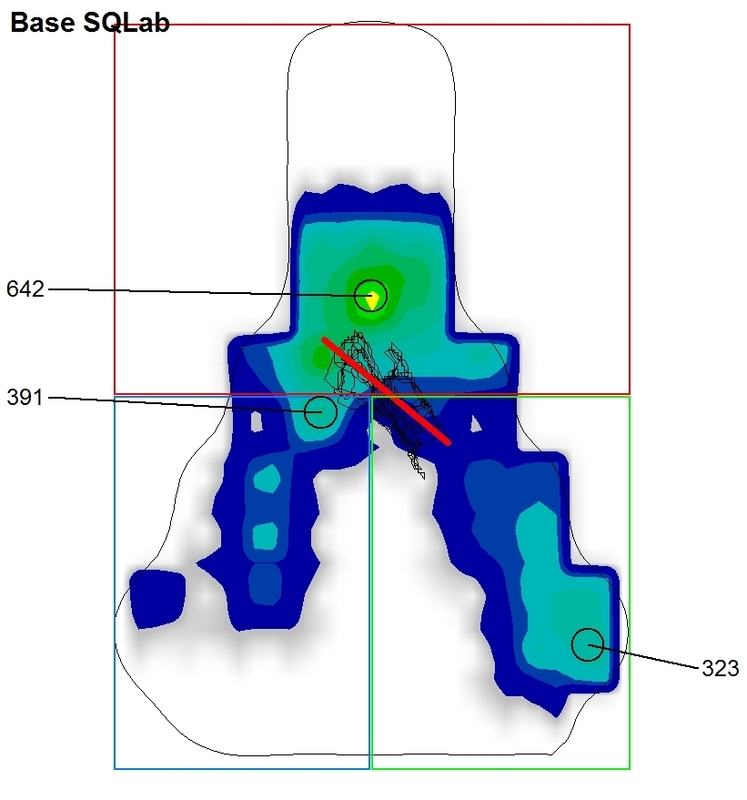 Saddle position and saddle model lead to increased pressure in the symphysis area (picture 1), which indicates an unstable pelvis position and an increased number of “saddle shifts”. Foot position is very pointed, the knee angle thereby is opened so wide that the seat height must be questioned as well (picture 2). The position is so compact that the pedaling movement goes backward-down. This could demand more energy than necessary. Although the hip angle is already small in the top crank position, Daniela’s very good mobility fans hopes for even more potential. All assumptions are written down and nothing is changed yet as we objectively do not yet know how aerodynamic the position really is. Therefore, we now go to the track in order to measure the CdA as well as the stability of her position in real time. 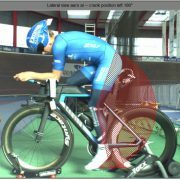 To do so we use the Track Aero System (Alphamantis, CA) as well as a new software development by gebioMized for measuring saddle pressure. Both systems send their data in real time via WIFI so that the results can already be analyzed during the run in order to discuss possible potential in our expert panel immediately. In order to determine the drag that is also called CdA in the field of aerodynamics, we use measurement technology on the bike that is Formula 1 worthy: With a small sensor we are collecting all ANT+ signals that are sent by Daniela’s Canyon during the test run: performance data, cadences, speeds etc. 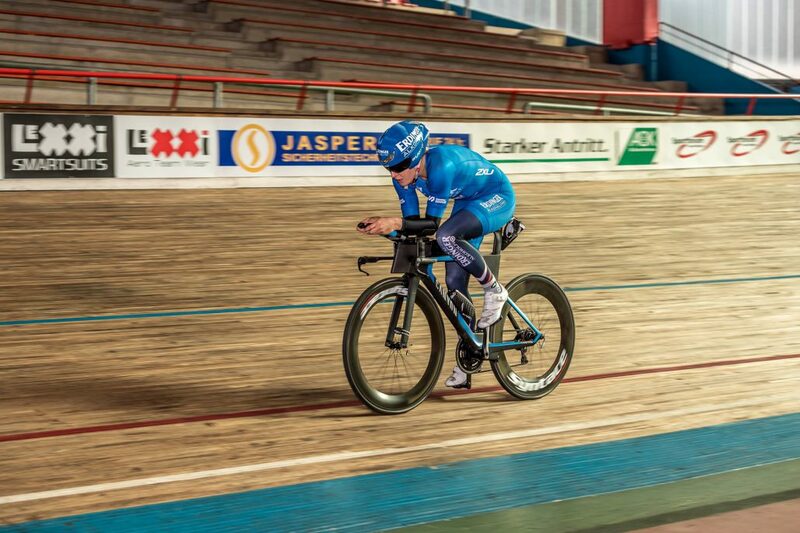 But not only Daniela and her bike need to be taken into account in order to neatly determine the drag; also environmental conditions like temperature, air moisture and all characteristics of the wooden track (length, curve inclination etc.) are considered. As soon as our measurement technology is ready for use, Daniela starts racking up miles while we conduct a first baseline measurement and determine her aerodynamic input value by means of the Alphamantis system. 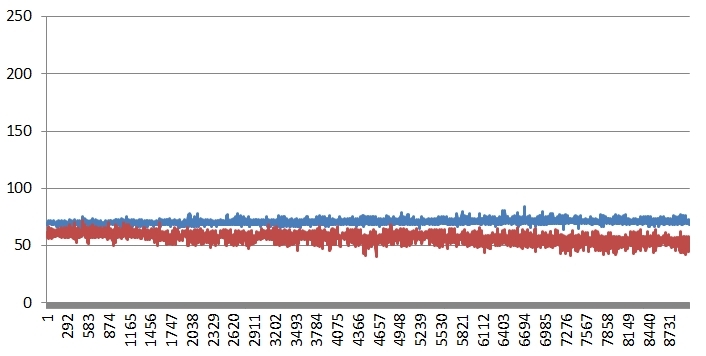 The analysis of the pelvis stability on the track clearly shows some optimization potential: Each outlier in the progressive graph stands for a “shift”, i.e. for an “active movement of the pelvis” to the back. These movements cause turbulences in the area of back and shoulders and therefore are detrimental to aerodynamics. 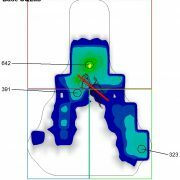 At the same time the power transfer in the direction of the pedal is negatively influenced by each shift. In Daniela’s case we measure 7.5 shifts per minute that is equivalent to a time interval of 8 seconds between shifts. The standard deviation of the ‘Center of Pressure’ shows with 18.5 a conspicuous value of instability as well. 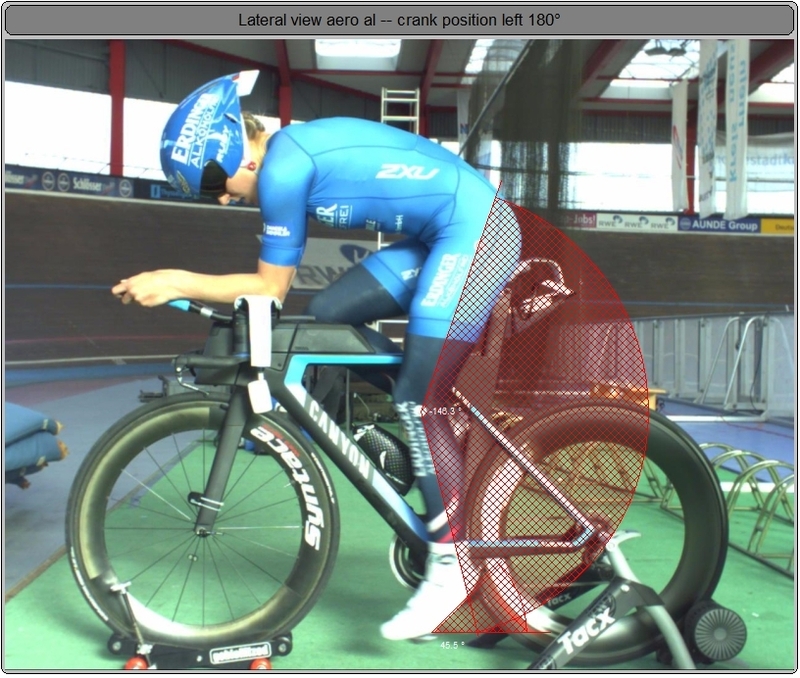 The session with Daniela shows that biomechanics and aerodynamics should go hand in glove if an athlete wants to reach the optimum for his/her position on the bike. With regard to the Ironman distance, we could save Daniela all in all approx. 12 watts at 40 km/h. 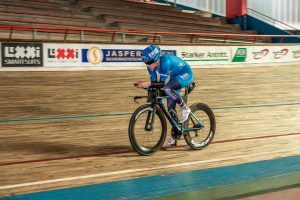 To her circumstances we are therefore talking about an improvement above 5 % that will save her on 180 km – in theory – around 5 minutes riding time. Without a considerable gain in stability aero improvements would not have been as significant as they were, without adjustments of the cockpit we would not have reached a significant CdA reduction neither. The parameter “stability” serves us as important control parameter to detect whether there still is potential or we are exaggerating it aerodynamics-wise. 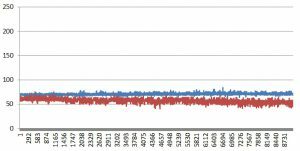 In addition to this, increased stability increases the chances that the position can be held over a longer period of time, e.g. 180 km. We always try to attain “passive improvements”, i.e. find a faster position that does not demand more active use of physical strength than necessary. You still can take active measures (“shrug”) afterwards, especially if you are a time trialist.